Everyone knows, as soon as you have a baby, one of the major items to purchase is a crib, therefore it is one of the items you’ll probably spend the most time researching. This is typically a costly purchase, plus you have to make sure all the safety standards are met, so it makes sense to do your homework before you shop. When it comes to cribs we have heard all kinds of arguments for or against different kinds of cribs but for us this is an important issue, since this is where the baby will be spending a lot of time sleeping. We were struggling to decide if we wanted to invest in a more expensive crib or buy something less expensive from Ikea or Walmart. However, we soon found out that all the cribs at Ikea were recalled because of faulty mattress supports collapsing. This quickly eliminated Ikea cribs off our list. 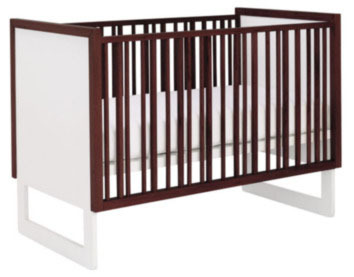 Our next option was Walmart but we were weary of similar quality issues and the cribs we liked, Baby Mod (sold at Walmart only, elsewhere it’s the exact same crib named Babyletto for $100 more) had nice modern lines but most of the reviews complained that the wood was too soft and was easily dented or worse could be chewed by the baby. Therefore one of our main goals was to try and find a good crib that was not made in China especially with all the safety issues for recalled products. We set a few goals to help narrow our search: non-toxic crib, eco-friendly (if in the budget), made in the USA and if that wasn’t possible then simply not made in China, and finally a modern crib. We set a budget for $300-600, which made it pretty tough to find a crib that met our goals and is still within our budget, but we were convinced we could find a good deal online. Oeuf cribs are marketed as eco-friendly cribs that are made in Europe and their most economical crib, the Robin crib, is within the upper tier of our price range. However, we were not entirely thrilled with the design of the crib, particularly the open slots on the side panels and the exposed hardware. Nurseryworks cribs, a competitor to Oeuf, has the Loom Crib that meets our outlined goals and has a unique personal design. The Loom Crib is non-toxic, made of catalpa wood, which is a fast growing wood, is made in the US (after speaking to the manufacturer we were informed that we received misleading information from some of the online suppliers and the Loom crib is in fact made in China) just squeezes into our upper tier budget level. But, as architects, what really appealed to us was the design of the crib. With typical crib designs, we dislike the rigidity of the repetitive vertical slats that seem to recall prison bars. What we loved with the loom crib is how the designers took the government required minimum spacing of the vertical slats and had some fun with it! Instead of equally spaced slats, they are varied to create visual interest. If you select the natural or dark finish the slats and wrapping trim contrast with the white side panels and frame. The hardware is neatly hidden and it’s a convertible crib with 3 mattress positions. The best part we found was that you do not need to spend the hefty price for the toddler conversion kit since the crib does not require it (whereas most do to keep the crib stable) to remain functional if the front side remains open. You could then buy an inexpensive guard and put it under the mattress and once your toddler is ready for a twin bed, the crib could be used as a day bed and still look great. Additionally, Nurseryworks has been very responsive to any questions via email. We are excited for our find and wanted to share it with everyone. Pali cribs, an Italian furniture company, makes affordable, modern design cribs made in Thailand or Vietnam. They offer more ‘traditional’ cribs that appeal to the US market but also offer simple designs as well. Specifically, the Pali Imperia Forever crib is under $400, made in Vietnam with local rubber wood, with a wood slat base, and is convertible to a toddler bed. Thanks Kenny, for the heads up, we will look into it as well. « Art Prints Available Soon!